A restricted document from U.S. Strategic Command provides insight into the underlying philosophy of military efforts to wage cyber warfare. Amid the disagreements about “notional environments” and “operational domains,” Schuh informed the conference that “experience gleaned from recent cyberspace operations” had revealed “the necessity for development of a lexicon to accommodate cyberspace operations, cyber warfare and various related terms” such as “weapons consequence” or “target vulnerability.” The lexicon needed to explain how the “‘four D’s (deny, degrade, disrupt, destroy)” and other core terms in military terminology could be applied to cyber weapons. The document that would later be produced to fill this void is The Cyber Warfare Lexicon, a relatively short compendium designed to “consolidate the core terminology of cyberspace operations.” Produced by the U.S. Strategic Command’s Joint Functional Command Component – Network Warfare, a predecessor to the current U.S. Cyber Command, the lexicon documents early attempts by the U.S. military to define its own cyber operations and place them within the larger context of traditional warfighting. A version of the lexicon from January 2009 obtained by Public Intelligence includes a complete listing of terms related to the process of creating, classifying and analyzing the effects of cyber weapons. An attachment to the lexicon includes a series of discussions on the evolution of military commanders’ conceptual understanding of cyber warfare and its accompanying terminology, attempting to align the actions of software with the outcomes of traditional weaponry. The cyber warfare community needs a precise language that both meets their unique requirements and allows them to interoperate in a world historically dominated by kinetic warfare. Mission planners must be able to discuss cyber weapons with their commanders, the intelligence analysts, the targeteers, and the operators, using terms that will be understood not just because they have been defined somewhere in doctrine, but also because they make sense. Giving the weapons planners a well-founded lexicon enables them to have far-reaching discussions about all manner of weapons and make important decisions with a significantly reduced likelihood of misunderstanding and operational error. To understand what exactly constitutes a cyber weapon and what makes it so different from the kind of weapons employed in traditional warfare, it is important to understand the objectives of cyber warfare. Cyber warfare is defined in the lexicon as the creation of “effects in and through cyberspace in support of a combatant commander’s military objectives, to ensure friendly forces freedom of action in cyberspace while denying adversaries these same freedoms.” This can be accomplished through cyber attacks, cyber defense as well as cyber exploitation, with each option providing its own unique set of associated capabilities and potential outcomes. Cyber attacks bare the greatest resemblance to popular notions of cyber war, incorporating actions to “deny or manipulate information and/or infrastructure in cyberspace” through methods like a computer network attack (CNA) that are intended to “disrupt, deny, degrade, or destroy the information within computers and computer networks and/or the computers/networks themselves.” Cyber defense is primarily focused on defending U.S. military networks from similar attacks conducted by other nations or non-state actors and protecting the integrity of the Department of Defense’s Global Information Grid (GIG) which carries military communications worldwide. Cyber exploitation is focused primarily on the collection of intelligence and other useful data from targeted computer systems to enable improved “threat recognition” that can contribute to future operations in cyberspace. These components of cyber warfare rely on capabilities that are used to construct cyber weapon systems. A cyber warfare capability is a “device, computer program or technique” that includes any combination of “software, firmware, and hardware” that is “designed to create an effect in cyberspace, but has not been weaponized.” Weaponization is a process that takes these capabilities and implements “control methods, test and evaluation, safeguards, security classification guidance, interface/delivery method” and other tactical considerations to ensure that the capability can be properly employed to produce the intended effect. A completed cyber weapon system is a combination of one or more of these capabilities that have been weaponized and are ready for deployment. These weapons can then be categorized based upon specific uses and issues related to their employment, such as who is authorized to use them. One suggested schema in the lexicon provides three categories: the first for weapons that require approval from the combatant commander, a second for weapons that are pre-approved for specific uses and a third that requires the approval of the President or Secretary of Defense before the weapon can be utilized. Brig. 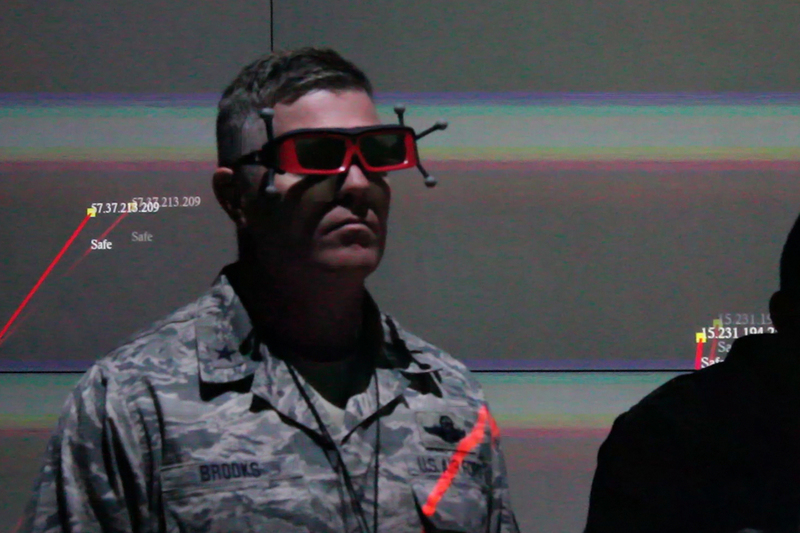 Gen. Robert Brooks, director of the Massachusetts Air National Guard gets a eyes-on 3D tutorial of how to analyze data in the Virtual Reality Center at the University of Arkansas at Little Rock, during the 2014 Cyber Shield Exercise held in May. A fundamental distinction discussed in the lexicon, one which separates cyber weapons from those used in conventional warfare, is the distinction between kinetic and non-kinetic weaponry. Kinetic weapons are those that “use forces of dynamic motion and/or energy upon material bodies” whereas non-kinetic weapons are those that “create their effects based upon the laws of logic or principles other than the laws of physics.” Within each of these broad categories, there are further distinctions based upon the lethality of the weapon being described. For example, a Mark-84 bomb is an example of a lethal kinetic weapon capable of inflicting physical damage to material entities based upon the use of motion and force. The Active Denial System, a directed-energy weapon which uses millimeter waves to create a sensation of heat on the skin of human targets, is an example of a non-lethal kinetic weapon. As a non-kinetic weapon creates its effect through the use of logic or other principles, the category necessarily encompasses a much wider array of weapon systems from diverse fields like information warfare and psychological operations. Biological and chemical weapons are examples of lethal non-kinetic weapons that rely upon biological factors rather than physical force to create their effect. Computer network attack (CNA) software, on the other hand, is an example of a non-lethal non-kinetic weapon, creating an effect based solely on the logical operations it performs on a targeted computer system. Quantitatively, denial (D) can be expressed as a function of scope (s), level (l), and time (t), i.e. D(s,l,t). Defining effects in this manner makes it clear to the planning staff that each of the parameters of the function must be considered and specified as necessary as indicated by, or derived from, commander’s objective. As the level (l) or amount approaches 100% and time (t) approaches infinity, destruction is achieved. The true effects of a cyber weapon often differ significantly from simply denying or even destroying an enemy system. Every weapon “takes an action” when it is triggered and this action is “intended to have an effect.” For a traditional bomb, that action is a “kinetic explosion and the effect is normally target damage,” whereas a cyber weapon may result in “the execution of some software and the effects, some form of denial or manipulation.” However, weapons also have “outcomes that are not expected and are not required to achieve the objective.” The lexicon describes these as indirect effects that can result in consequences for unintended targets. When these consequences affect unlawful targets or cause “damage to persons or objects that would not be lawful military targets,” they are considered “collateral effects” that are similar to the traditional notion of collateral damage. (U//FOUO) Detectability risk – The risk that a weapon will be unable to elude discovery or suspicion of its existence. This includes the adverse illumination risk of hardware weapons. (U//FOUO) Attribution risk – The risk that the discoverer of a weapon or weapon data will be able to identify the source and/or originator of the attack or the source of the weapon used in the attack. (U//FOUO) Co-optability risk – The risk that, once discovered, the weapon or its fires will be able to be recruited, used, or reused without authorization. (U//FOUO) Security Vulnerability risk – The risk that, once discovered, an unauthorized user could uncover a security vulnerability in the weapon that allows access to resources of the weapon or its launch platform. This includes the risk of an adversary establishing covert channels over a weapon’s C2 link. (U//FOUO) Misuse risk – The risk that the weapon can be configured such that an authorized user could unintentionally use it improperly, insecurely, unsafely, etc. (U//FOUO) Policy, Law, & Regulation (PLR) risk – The risk that the weapon can be configured such that an authorized user could intentionally use it in violation of existing policy, laws, and regulations. Unconfirmed: Unknown if there is an access path to target. Confirmed/Nominal: Access path to target established. Unprivileged access: Unprivileged access to target established. Privileged access/At risk: Privileged access to target established. Goal/Other condition: Target has been placed in the desired or other intermediate condition. Select a term from the following list to read the full definition. All definitions are taken from U.S. Strategic Command (USSTRATCOM) Cyber Warfare Lexicon Version 1.7.6. (U//FOUO) cyber warfare (CW): Creation of effects in and through cyberspace in support of a combatant commander’s military objectives, to ensure friendly forces freedom of action in cyberspace while denying adversaries these same freedoms. Composed of cyber attack (CA), cyber defense (CD), and cyber exploitation (CE). (U//FOUO) cyber attack (CA): Cyber warfare actions intended to deny or manipulate information and/ or infrastructure in cyberspace. Cyber attack is considered a form of fires. (U//FOUO) cyber defense (CD): Cyber warfare actions to protect, monitor, detect, analyze, and respond to any uses of cyberspace that deny friendly combat capability and unauthorized activity within the DOD global information grid (GIG). (U//FOUO) cyber exploitation (CE): Cyber warfare enabling operations and intelligence collection activities to search for, collect data from, identify, and locate targets in cyberspace for threat recognition, targeting, planning, and conduct of future operations. (U//FOUO) cyber warfare capability: A capability (e.g. device, computer program, or technique), including any combination of software, firmware, and hardware, designed to create an effect in cyberspace, but that has not been weaponized. Not all cyber capabilities are weapons or potential weapons. (U//FOUO) cyber weaponization: The process of taking an offensive cyber capability from development to operationally ready by incorporating control methods, test and evaluation, safeguards, security classification guidance, interface/ delivery method, certified and trained personnel, employment recorder, CONOP, TIP, life-cycle support, and launch platform. (U//FOUO) cyber weapon delivery mode: The method via which a cyber weapon (or a command to such a weapon) is delivered to the target. Delivery may be via direct implant or remote launch. Hardware cyber weapons often require direct implant. Remote launched cyber weapons and/or commands may be placed via wired and/or wireless paths. (U//FOUO) cyber weapon flexibility: The extent to which the cyber weapon’s design enables operator reconfiguration to account for changes in the target environment. (U//FOUO) cyber weapon identification: The manner in which a cyber weapon is represented for inventory control purposes, based on the weapon’s forensic attributes (e.g. for software: file name, file size, creation date, hash value, etc., for hardware: serial number, gram weight, stimulus response, x-ray image, unique markings, etc.). detectability risk – The risk that a weapon will be unable to elude discovery or suspicion of its existence. This includes the adverse illumination risk of hardware weapons. attribution risk – The risk that the discoverer of a weapon or its effect will be able to identify the source and/or originator of the attack or the source of the weapon used in the attack. co-optability risk – The risk that, once discovered, the weapon or its fires will be able to be recruited, used, or reused without authorization. security vulnerability risk – The risk that, once discovered, an unauthorized user could uncover a security vulnerability in the weapon that allows access to resources of the weapon or its launch platform. This includes the risk of an adversary establishing covert channels over a weapon’s C2 link. misuse risk – The risk that the weapon can be configured such that an authorized user could unintentionally use it improperly, insecurely, unsafely, etc. policy, law, & regulation (PLR) risk – The risk that the weapon could be configured such that an authorized user could intentionally use it in violation of existing policy, laws, and regulations. (U) access: Sufficient level of exposure to or entry into a target to enable the intended effect. (U) collateral effect: Unintentional or incidental effects, including injury or damage, to persons or objects that would not be lawful military targets in the circumstances ruling at the time. (U) deny: To attack by degrading, disrupting, or destroying access to or operation of a targeted function by a specified level for a specified time. Denial is concerned with preventing adversary use of resources. degrade(U) degrade: (a function of amount) To deny access to or operation of a targeted function to a level represented as a percentage of capacity. Desired level of degradation is normally specified. disrupt(U) disrupt: (a function of time) To completely but temporarily deny access to or operation of a targeted function for a period represented as a function of time. Disruption can be considered a special case of degradation where the degradation level selected is 100%. destroy(U) destroy: To permanently, completely, and irreparably deny access to, or operation of, a target. Destruction is the denial effect where time and level are both maximized. • denial – degrade, disrupt, or destroy access to, operation, quality of service, or availability of target resources, processes, and/or data. • manipulation – manipulate, distort, or falsify trusted information on a target. • command and control – provide operator control of deployed cyber capabilities. • information/data collection – obtain targeting information about targets or target environments. • access – establish unauthorized access to a target. • enabling – provide resources or create conditions that support the use of other capabilities. (U) kinetic: Of or pertaining to a weapon that uses, or effects created by, forces of dynamic motion and/ or energy upon material bodies. Includes traditional explosive weapons/ effects as well as capabilities that can create kinetic RF effects, such as continuous wave jammers, lasers, directed energy, and pulsed RF weapons. (U) non-kinetic: Of or pertaining to a weapon that does not use, or effects not created by, forces of dynamic motion and/ or energy upon material bodies. (U) lethal: Of or pertaining to a weapon or effect intended to cause death or permanent injuries to personnel. (U) non-lethal: Of or pertaining to a weapon or effect not intended to cause death or permanent injuries to personnel. Nonlethal effects may be reversible and are not required to have zero probability of causing fatalities, permanent injuries, or destruction of property. (U//FOUO) manipulate: To attack by controlling or changing a target’s functions in a manner that supports the commander’s objectives; includes deception, decoying, conditioning, spoofing, falsification, etc. Manipulation is concerned with using an adversary’s resources for friendly purposes and is distinct from influence operations (e.g. PSYOP, etc.). (U) probability of effect (PE): The chance of a specific functional or behavioral impact on a target given a weapon action. (U) target state: The condition of a target described with respect to a military objective or set of objectives. (U) targeted vulnerability: An exploitable weakness in the target required by a specific weapon. objective vulnerabilityobjective vulnerability: A vulnerability whose exploitation directly accomplishes part or all of an actual military objective. access vulnerabilityaccess vulnerability: A vulnerability whose exploitation allows access to an objective vulnerability. (U) weapon action: The effect-producing mechanisms or functions initiated by a weapon when triggered. The weapon actions of a kinetic weapon are blast, heat, fragmentation, etc. The weapon actions of a cyber attack weapon might be writing to a memory register or transmission of a radio frequency (RF) waveform. (U) weapon effect: A direct or indirect objective (intended) outcome of a weapon action. In warfare, the actions of a weapon are intended to create effects, typically against the functional capabilities of a material target or to the behavior of individuals. Effect-based tasking is specified by a specific target scope, desired effect level, and start time and duration. direct effectdirect effect: An outcome that is created directly by the weapon’s action. Also known as a first order effect. indirect effectindirect effect: An outcome that cascades from one or more direct effects or other indirect effects of the weapon’s action. Also known as second, third, Nth order effects, etc.